Since Funcom’s initial announcement of plans to reboot its modern occult MMO The Secret World as Secret World Legends in order to switch it to free-to-play, a lot of veteran players have been on the fence — myself included. Like a lot of TSW players, I recognized the game had issues right from the start. Possibly the most glaring of these was combat that could be described at best as “soft” — meaning it just didn’t feel like it had the impact it should. But, the one thing the game has always had that made it worth playing — at least in the eyes of TSW veterans — was the story. The game offers a world different from most MMOs floating around out there and the various type of missions and the methods of acquiring them made it feel highly organic. The attention to detail also offered fans of role-playing great opportunities to get their RP on. But with the announcement of Secret World Legends, there came concern. The combat has been reworked into an action MMO style complete with reticule. Perhaps more concerning is that the game is being rebooted as a new game with completely revamped systems (even crafting) so TSW veterans who had spent hours playing through this story will have to start all over again and work their way back up to whatever part they were currently working on in the other game. Granted, Funcom has already said they would be transferring in certain items, rewards, and the like for veteran players. But will it be worth it to us to effectively start from scratch? And will it be enough to bring new players in anyway? Recently, I spent some time in the game with Game Director — and fellow Dragon — Romain Amiel who tried to alleviate some of my worries regarding the new launch and explain the why and how of it all. Amiel offered me a short tour of the game starting with character creation, which has changed a bit from TSW, and ending with a brief romp in one of the game’s early dungeons, where he explained how they have been made more accessible to players who might be a bit grouping-shy. To address the concerns I expressed at the beginning of the tour, Amiel explained the logic behind the transition, and a few things that prompted it. The idea behind the reboot was to try to focus on the game’s strength which, in TSW’s case, has always been the storytelling. They wanted to make it accessible to everyone and encourage players who haven’t given it a shot — likely due to the up front cost — to do so. 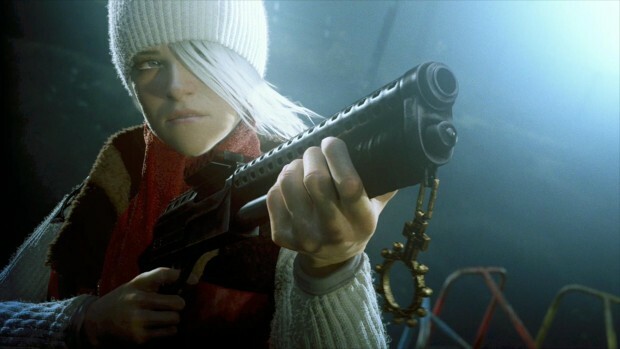 They also wanted to adjust some of the game’s more daunting mechanics, such as skill allotment, in order to make it easier for the general public to pick up and play. According to Amiel, one of the main goals for the Funcom team was to be able to tell the rest of The Secret World’s story. The team has the game’s story planned out across several seasons and events, and with the first season finished they want to be able to tell the rest. However, it turns out that the story the Secret World team wants to tell is fairly costly. Things like handmade missions, cut scenes, writing, and voice over can drive the cost up, and the developer doesn’t want to sacrifice its quality. The problem is that TSW is too niche and difficult for some people to get into. And as appealing as it is, the game’s storytelling isn’t all that great for monetization. Various factors inhibit its profitability; such as players who intend to buy a content update (or issue) waiting to do so because they haven’t made it through the content they already have yet. This often resulted in players simply picking up the episodes at a later time — and a lower cost. (I can attest to this, having done it myself.) So, taking this into account, they decided to make all story content available to players for free and find other ways to monetize the game. The solution the team came up with was to transition to free-to-play, eliminating the initial entry barrier caused by that need to drop some cash on the game. To achieve this they decided to rebuild the game rather than simply trying to build the new system into the existing version and ending up with something clunky and somewhat gated. A rebuild allowed them to give players access to everything in the game without having to spend any money on it what-so-ever. And when they say you don’t actually have to spend money, they mean it. Although, Amiel admits that they hope you’ll want to. We started the tour by checking out character creation. Originally a series of drop down menus and sliders, character creation has been simplified. It starts out the same way TSW creation does, by asking players to choose their faction, but from there it deviates. 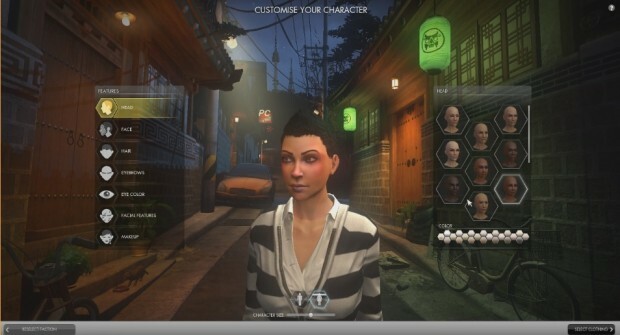 Instead of sliders, players are given several pre-crafted heads designed to cover a variety of races and ages. Players select one of these and the desired skin tone. From there, they’re given a selection of faces, hair styles and colors, eye option, and a variety of facial “features” — including tattoos and makeup — to further customize the character with. Clothing also got a bit of a revamp as far as character creation goes. Instead of the same options players have been looking at for the past five years, there are new “starter” items available at character creation — ranging from casual to business attire. That said, of the 6,500+ pieces of clothing currently available in The Secret World, more than 4,000 of them have been transferred into Secret World Legends, including items earned from special events. That’s great news for TSW players who already own a large portion of them. And, as with TSW, SWL players will be able to dress their characters up pretty much any way they like — even as scary looking bunnies. The major difference in character creation is that once they have finished out the appearance part, players will be asked to choose a starter class. 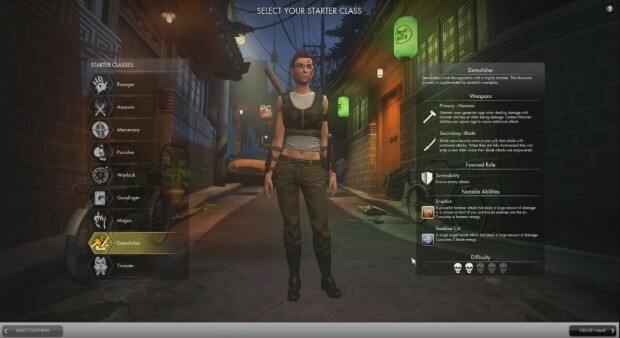 These are base classes and those who played The Secret World might recognize the starter classes as some of the deck options available in the earlier game. 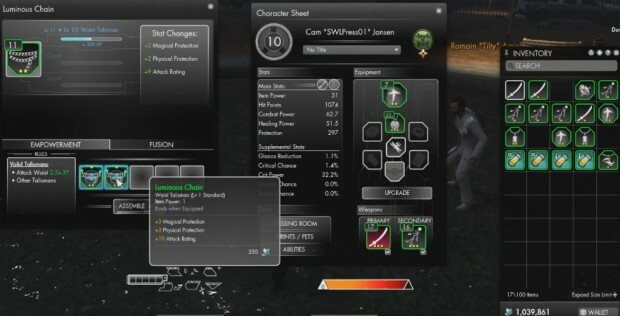 As with TSW’s decks, starter classes combine two weapons and their related abilities. For example, the Demolisher class seen below combines the Hammer and Blade weapons to create a role focused on survival. In other words… It’s a tank. You’ll also note a difficulty indicator on the class’ stat sheet, ranging from one to five skulls. This is an attribute created by what are referred to as specializations. Each weapon has its own specialization; such as the pistol roulette system seen below. For some weapons, these are fairly easy to deal with, requiring almost no action on the player’s part. The pistol is a great example of this. Other weapons have more complicated specializations. The blade, for instance, builds power with use. Once enough power has been accumulated, a special ability becomes available that the player must use before a timer runs out. If the timer runs out, the power is gone and they will need to start over again. 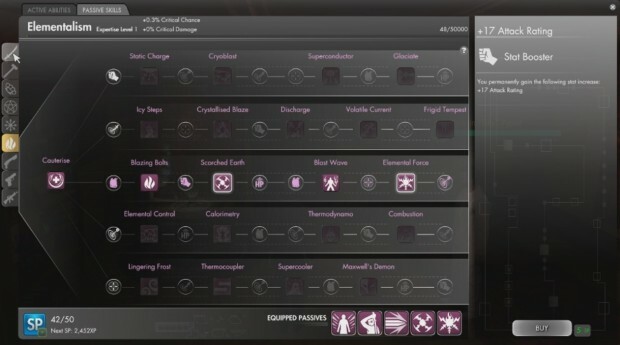 To make things more interesting, players can use passive abilities related to their weapons to change the way these specializations act. One example would be to use a passive ability that converts blade power not used in time to be used in healing, keeping it from going to waste. Soft Combat to Action Combat? Following the introduction of the classes and specialization rundown, I inquired a bit about the game changing to an action combat system. This is a big change for TSW players, who may not have been anywhere near in love with the existing system but were at least comfortable with it and might not be as big of fans of the action combat seen in other MMOs like TERA. Amiel explained the shift, stating that they wanted something that feels natural to new players while still being acceptable to Secret World veterans. The system they came up with, while using reticule-based combat, isn’t quite as demanding as you’d find in games like TERA. You won’t be targeting extremely specific things here. Rather, if you’re in the general area, you should be good. He also noted that while TSW players who have spent time with the game’s beta were originally pretty down on the system — some even saying that it ruined their life — they’ve come to appreciate it and are even having fun with it. That said, players had a lot of feedback on the system, noting things like the reticule being too large, or not liking the shape or the fact it was there at all. Others didn’t like where the camera was placed. This feedback has resulted in the devs giving players more options to customize their play feel. One of the most important things they got feedback on was that a lot of players only play TSW using their keyboard and forgo the mouse, whether it be due to preference or disability. To address this, they reworked the system so that players who might otherwise not be able to physically make the move to the new system weren’t shut out. For me, this was great news. I suffer from extreme carpal tunnel in both wrists and I wasn’t sure I’d be able to handle the continuous clicking that action combat tends to need. Once my character was created, we hopped into game and briefly looked at the new tutorial area, which comes along with a few new cutscenes. The idea behind this was to give players tutorials on weapons they’re actually going to be using, rather than their first real experience being with a weapon they don’t use as was the case with the original game. There, you were given a shotgun to work with having not selected your primary two weapons at the time. The tutorial also offers players an explanation as to the different kind of missions available in the game. Off on an Epic Quest! After the fairly lengthy introduction, I was given a level 9 character to jump on for a while and went to the game’s first zone, Kingsmouth, to run what is admittedly one of my favorite early quests and to get a general feel of the combat and the questing system. Quest wise, things haven’t changed too much. That said, there are some pretty big changes when it comes to things like the ability wheel — which is now more ability pages and tabs. Amiel took a moment to explain the new system to me before we grabbed our quest. Instead of trying to fill out a wheel filled with over 500 skills, players are presented with a menu showing tabs for nine weapons on the side. Each weapon has 15 active skills and around 20 passive skills. Filling out the active skills unlocks elite skills at the end. The abilities are divided into three types as well. The first row of abilities is centered on solo play while the bottom is designed more for group play. The middle row is for specialization. Another very important skill wheel change is that players will now be able to make their characters stronger by mastering weapons. 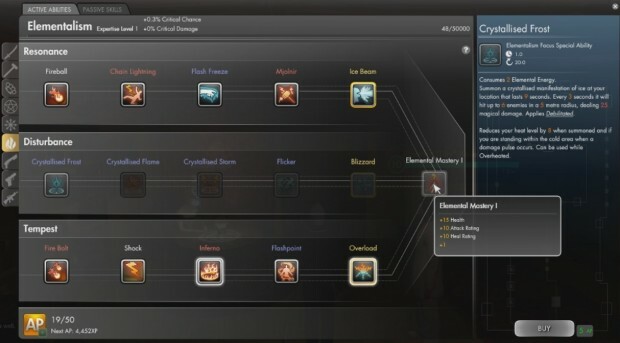 Unlocking the Mastery capstone for each weapons boosts a character’s health, attack rating, and heal rating. The more weapons players complete, the higher their capstone and stats become. In addition, completing passive skills will also unlock additional stat boosts for the character, as indicated by the small circles seen in the passive skills page. While running The Raven quest, Amiel explained that with the new game they’ve elected to limited the number of players that can run around in a field to about 10, giving priority to friends in order to give players a more personal experience when doing missions. He also noted a variety of visual changes made to give the zone we were in a more creepy feel rather than just feeling foggy with zombies. Once the mission was completed, he demonstrated the upgrade/weapon assembly system. This system replaces the old crafting system that required players to memorize shapes to make weapons. Instead, players can now sacrifice items to create more powerful items, never having to worry about ending up with trash. Of course, if players don’t want to sacrifice the item to upgrade one, they can still trade it on the auction house. Next, we ran an early dungeon, which has been modified to allow three players of any kind to hop in and play. For dungeons like these, the holy trinity isn’t needed. It can be completed with three tanks, three DPS, whatever. These “story” dungeons are designed to give players a taste of dungeons without subjecting them to the stress of being dungeon-shy and worrying about upsetting other players for being bad. For those who love dungeons, don’t worry. This is only one type of dungeon option. More complicated and traditional dungeons are available. At the end of the dungeon, or after killing one of its bosses, players will find a loot chest that will require a key to open. I know… Don’t freak out yet. Players will automatically be given 12 free keys per day. This means that they can run two dungeons per day (each has 6 bosses) and open every loot chest. 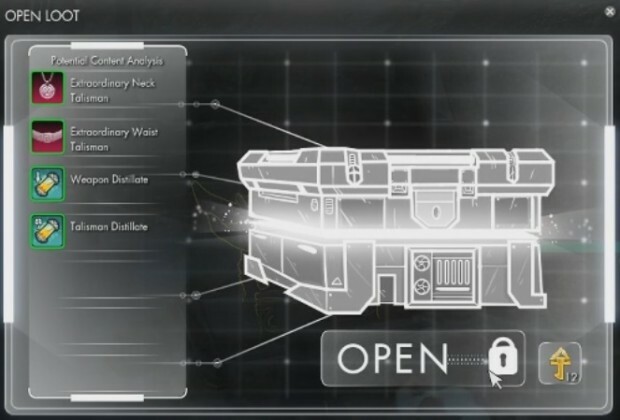 After that, if they want to be able to open more chests, they will need to buy more keys. That said. The keys do not have to be bought with real-world cash. Rather, players can spend currency earned via gameplay to buy more. As Amiel notes, with this system players can do everything in the game without spending any real world money at all. Finally, Amiel took me to Agartha, the game’s central hub / tree-highway to everywhere you need to go in the game. Players of the old game will note two major changes to the zone. The first is that you’ll no longer run along the branches to get where you need to go. Instead, you hit springboards which send you flying to another platform. These springboards are marked to let you know where you’re headed. No longer do you have to guess. The other change is that there is now a central hub where players can do everything they used to go into London for. Shops, the auction house, and more are all available here. This is also where you’ll find nifty roleplay setups like a DJ booth and dance floor. At the end of the tour, we went back to discussing the free-to-play system a bit. One important thing of note is that premium currency is tradeable to other players for currency earned in game, meaning that no player is locked out of buying premium items. In the end it really comes down to whether you want to spend time or cash and if you’re willing to trade with other players. Of course, for those players who’d like more perks, there is still the option to subscribe, which offers things like unlimited teleportation, extra keys, and bonus daily login rewards. I think it’s fair to say that the reboot is an interesting choice, and the tour did help alleviate some of my concerns regarding the game. Although I’m still not sure how big I’m going to be on the combat… or having to do the entire story line over again. 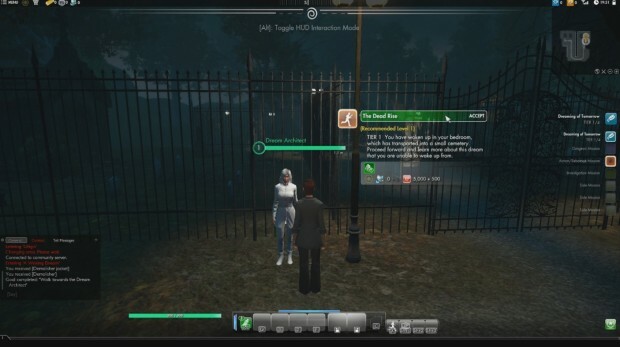 That said, they are trying to make it worth the player’s while, offering TSW players the ability to keep rewards earned in the original game while earning completely new ones for completing the same activities in Secret World Legends. I’ll definitely be spending a bit more time in game to see how things go… and maybe I’ll see about getting the old group back together for fun times in Kingsmouth. Dunno the DIRTY LAUNDRY CODE+KINGSMOUTH CODE..Help please. Apparently it was a common complaint among players that they were having difficulty making characters look good with the old system. Take that for what you will. Yeah, I know they must have had reasons for every single change they have made. I just really don’t like it when developers are simplifying their game instead of making it easier to understand without losing the complexity. P.S. Wow, now I even got a reaction from the author of the article. o_o Gotta control the level of salt in my posts from now on. lol Oh. No. I wasn’t replying due to you being salty. It’s just an area I felt I’d failed to explain. To be honest, the tour was an hour and a half long and it was just impossible to put in everything he went over. So, the things I felt people might be a little less concerned about I went a bit minimalist on. That said, the character creation change wasn’t really a simplification as it was making a system that was originally designed to “look” more powerful be clearer. During the tour, it was explained that the sliders in TSW really were just presets like we’ll have in the game, only because it was done with sliders, it made everything feel more robust. So, this is simply presenting it in a different way. Of course, it’s been FOREVER since I’ve made a character in TSW due to just not needing to, so I can’t speak to the accuracy of that. I’m sure you didn’t fail to explain anything, it was just me seeing what I want (or don’t want in this case) to see because I can’t stand simplification.